Our friends at Judicial Watch have just released a new batch of Internal Revenue Service (IRS) email documents revealing that under former IRS official Lois Lerner, the agency seems to acknowledge having needlessly solicited donor lists from non-profit political groups. 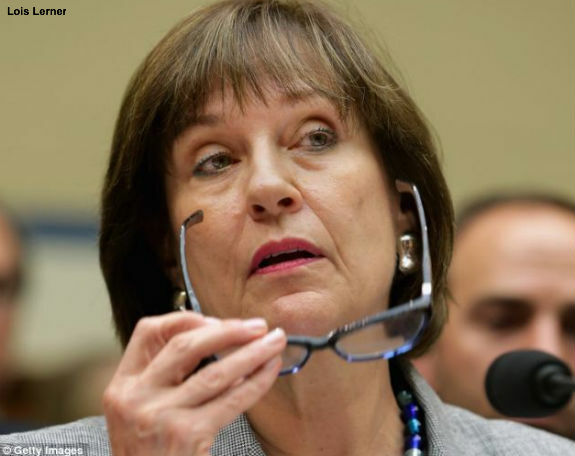 Later, in her May 10, 2013, remarks in which Lerner first revealed in response to question she planted about the IRS targeting of conservative groups, she conceded that the requests for donor names was “not appropriate, not usual.” The new documents obtained by Judicial Watch also reveal that 75% of the groups from whom the lists were solicited were apparently conservative, with only 5% being liberal. Lois, I wanted to get back with you with respect to your question whether TEGE [Tax Exempt & Government Entities] could return to those organizations from whom donor names were solicited in questionnaires following their submission of applications for recognition of their tax exempt status (under 501(c)(4)), now that TEGE has reviewed those files and determined that such information was not needed across-the-board and not used in making the agency’s determination on exempt status. Joseph Urban [IRS Technical Advisor, Tax Exempt and Government Entities] had actually started a secret research project on whether we could, consistent with 6104, argue that [REDACTED] Joe was quite agitated yesterday when I told him what we were doing. (He was involved when the initial question was raised, but we didn’t continue reading him in). At one point he started saying that this was a decision for Steve Miller–I told him we were already doing it, and that I didn’t know whether Lois had already talked to Nikole [former IRS Chief of Staff to IRS Commissioner Steve Miller] about this. Would not be surprised if he already started working on Lois. Lerner’s and other IRS officials’ concerns about how to handle these donor lists came on the heels of an advisory from the Treasury Inspector General for Tax Administration (TIGTA) to her and other IRS officials in late March 2012 of “an audit we plan to conduct of the IRS’s process for reviewing applications for tax exemption by potential section 501(c)(4), 501(c)(5), and 501(c)(6) organizations.” The documents produced do not detail the “secret research project” nor disclose how the IRS used the donor names the agency improperly obtained. The House Ways and Means Committee also announced at May 7, 2014 hearing that, after scores of conservative groups provided donor information “to the IRS, nearly one in ten donors were subject to audit.” In 2011, as many as five donors to one conservative (c)(4) organization were audited, according to the Wall Street Journal. And this past June, the IRS admitted wrongdoing in releasing the conservative National Organization for Marriage’s (NOM) confidential tax return and donor list, which were published in March 2012 by the Human Rights Campaign. The Human Rights Campaign is the chief political rival to NOM; its outgoing president had been named a national co-chair of the Obama Reelection Campaign. The IRS reportedly agreed to pay NOM $50,000 to settle the lawsuit. Of the 199 (c)(4) cases, approximately 3/4 appear to be conservative leaning while fewer than 10 appear to be liberal/progressive leaning groups based solely on the name. The remainder do not obviously lean to either side of the political spectrum. Please inform the reviewers and staff in your groups that before issuing any favorable or initial denial rulings on any cases with advocacy issues, the reviewers must notify me and you [Lerner and other senior IRS staffers] via e-mail and get our approval. No favorable or initial denial rulings can be issued without your and my approval. The e-mail notification includes the name of the case, and a synopsis of facts and denial rationale. I may require a short briefing depending on the facts and circumstances of the particular case. Although Quality was on board and involved with the training, we are seeing some tendency for Determs staff to continue to over -develop political activity issue. When asked why, they say they are concerned that if they don’t, Quality will ding them. If can’t reach agreement, it comes to Holly. June 26, 2012: — Email from Lerner to Holly Paz and Cindy Thomas in which Lerner notes that TIGTA asked for files directly from the Federal Records Center and warns that this makes sense in “context of a really sensitive investigation alleging political bias by the IRS.” The Federal Records Act (FRA) requires the preservation of official e-mails at the National Archives Federal Record Center. This email from Lerner was dated during the same time period during which the IRS claims her emails were lost and her Blackberry was “wiped clean” and “removed as scrap for disposal …” In violation of Section 3106 of the FRA, the IRS failed to notify the Archives that Lerner’s emails were missing. Thanks–sorry, but I really have no clue what he means by a companion process that “administers the same provisions of the tax law in the context of new applications for tax -exempt status. The legal issues and the information that will inform our discussions will be similar in both contexts.” As I will need to talk to TIGTA about this on Thursday, perhaps you can give me a better sense of what he is referring to? I could guess, but don’t want to be guessing in this context. The communications sought by Judicial Watch covered portions of the same period for which the IRS on June 13, 2014, notified the Senate Finance Committee that Lerner’s emails had been lost or destroyed but did not notify the Court or Judicial Watch about these missing emails. In response to our request for more information, U.S. District Court Judge Emmett Sullivan held a July 10 hearing and order the IRS to produce sworn declarations about its efforts to find and restore Lerner’s allegedly missing emails. And then on August 25, Department of Justice attorneys for the IRS conceded to Judicial Watch that Lerner’s “missing emails” (and all government records) had been backed in case of catastrophe but that it would be too “onerous” to search this backup system for Lerner’s emails. The Justice Department has since put out anonymous statements alleging Judicial Watch “misheard” what its lawyers said and that the agency did not disclose “new” information about a back-up system. It is not in dispute that the existence of any back-up system was withheld from the court despite two orders (order 1, order 2) demanding specifically sworn declarations about where Lerner’s emails may be residing and effort to obtain them. The Obama administration has refused Judicial Watch’s requests to amend the sworn declarations and finally inform Judge Sullivan directly about this back-up system. Administration lawyers have steadfastly refused and subsequently submitted a “status report” to the Court on August 29 that, again, makes no mention of any back-up system. Judicial Watch lawyers are preparing now to ask the Court for relief in light of the Obama administration’s continuing obstruction and contempt for Judge Sullivan’s orders. “Again, Judicial Watch has uncovered more shocking emails from the IRS, forced out by a lawsuit and a federal court,” said Judicial Watch President Tom Fitton. “Now we learn the stunning news that Obama’s IRS had a ‘secret research program’ using illicitly-obtained confidential donor lists of conservative and Tea Party organizations that opposed President Obama’s agenda or reelection. With all this IRS abuse, it is no wonder Lois Lerner said that questions by Congress and others were ‘dangerous.’ And it is well past time that President Obama should be held to account about his repeated and recent falsehoods about his IRS scandal.